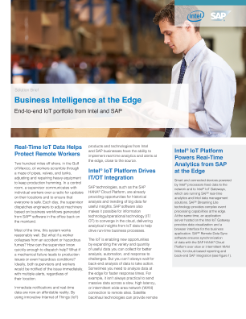 Smart and connected devices powered by Intel® processors feed data to the network and to Intel® IoT Gateways, running SAP* real-time analytics and Intel data management solutions. The combined technologies provide event processing and data hosting at the edge for access from a browser interface on any device. SAP* Remote Data Sync software synchronizes data with the SAP HANA* Cloud Platform over ...slow or intermittent WAN links, for cloud-based reporting and back-end SAP integration.